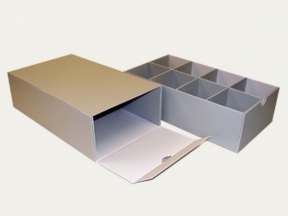 Archival box with grid partitions for the storage of small and delicate objects. 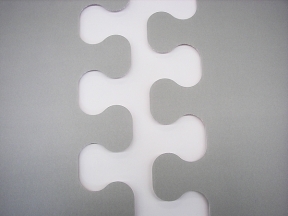 For the storage of small, delicate and/or easily damagable objects, every now and then grid partitions (dividers) are required. This is often the case, for existing boxes or for new archival boxes. 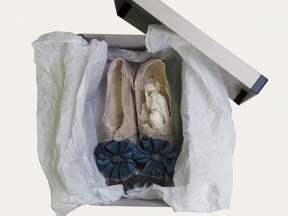 Among the wardrobe of the Austrian Order of the Iron Crown, ten pairs of shoes made of white velvet with blue satin rosettes and silver fringes have been preserved. They were manufactured around 1816/17 following the designs of the Costume Director of the Court’s Theater, Philipp von Stubenrauch. Archival two-piece box KS 16 with puzzle connection ends – made for tubes and roll storage. 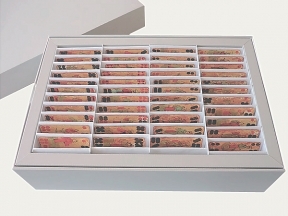 "Storage of varnished, permanently sticking playing cards" - This application example demonstrates the versatile implementation of KLUG boxes!